The appeal of British Youtuber Zoe Sugg (a.k.a. Zoella) is impossible to deny – she’s quirky, engaging and she lives the kind of picture-perfect life that is rarely seen outside of a Disney movie. Though I’m a little older (okay…a lot older) than her target audience, I watch her vlogs religiously to get my weekly dose of Nala, her adorable pug puppy. Not only is Zoe a Youtube sensation (her main channel has over 11 million subscribers), but she’s also currently working on the third book in her Girl Online series AND has an ever-expanding line of beauty and lifestyle products to top it off. Good news if you’ve been looking to add something sweet to your pamper seshs…Zoella Beauty is finally coming to Canada! The Zoella Beauty Core Collection includes cute makeup bags, a reed diffuser, and various scented body products, such as body lotion, hand cream, shower gel, fragrances and a fizz bar that looks good enough to eat (literally! it looks so yummy that there’s a “DO NOT EAT!” warning on the packaging). 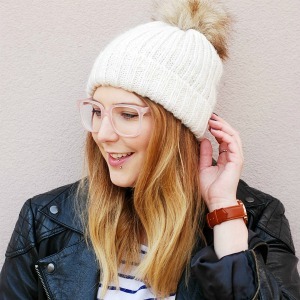 The products are newly available in Canada through Farleyco, and you will also be able to buy the Zoella Beauty range in some Pharmasave, London Drugs, IDA, Lawtons Drugs, Familiprix, Brunet and Uniprix. One of the strong point of the Zoella Beauty collection is the packaging. Pink and cream, with polka dots and pretty fonts…It’s a perfect visual representation of the Zoella brand. I’m not sure what it says about me that the cutesy packaging really speaks to me despite being aimed at teenagers, but I absolutely love it. If you like fresh floral scents with a hint of sweetness, you’ll want to get your hands on the Blissful Mistful fragranced body mist*. The scent is surprisingly sophisticated for a product mainly aimed at young teenagers. It’s very grown-up and subtle. It sure beats the overly sweet body mists of my youth. A quick spritz will instantly make your day a little brighter. The scent only lingers for an hour or so, but it’s the kind of longevity I usually expect from a mist. It’s perfect for lazy days of pottering around the house and chilling in your coziest pjs. The bottle looks great on my dresser with its polka dots and pink metallic cap, and I think it will also make a great blog prop…if I don’t use up the entire thing before my next photo shoot day, that is. 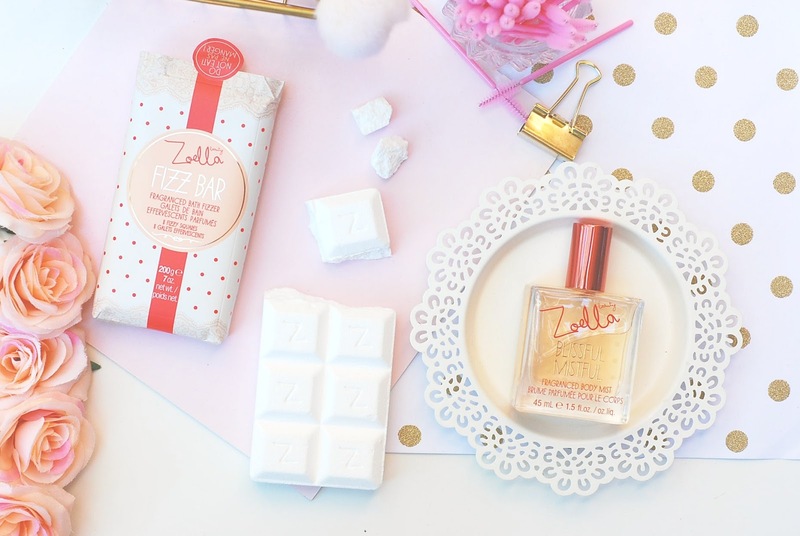 The Zoella Beauty Fizz Bar* smells just as beautiful as the Blissful Mistful mist, but you can literally bathe in its milky-coloured and fragranced goodness. Full disclosure: I don’t have a bath, so I tested it in the sink. It did the job, but it was not quite the relaxing experience you’ll get to enjoy at home. I only managed to soak my hands and forearms, but it left my skin feeling soft and moisturized. The scent didn’t linger on the skin at all, which was a little disappointing, nor did it make my bathroom smell lovely. Insert sad emoji here. The bar breaks off in big chunky squares, so you can easily add as little or as much fizz to your bath as you want. I used one square and found that it fizzed away quite quickly without leaving any residue. Keep in mind that I was testing it in a university residence sink, so you will most likely need to use a couple more square for the Fizz Bar to work its magic on your skin. To celebrate the long-awaited arrival of Zoella Beauty in Canada and the upcoming release of Girl Online: Going Solo, I’m partnering with Farleyco for a lovely little giveaway. The winner will receive Zoe’s second novel, Girl Online: On Tour, as well as a Zoella Beauty product of their choice from the Farleyco website. The contest will run from October 3, 2016 to October 12, 2016 (12am) and is open to Canadian residents only. Good luck! Which Zoella Beauty product would you pick if you won the giveaway?